I’m no dog professional, dog trainer or a dog behaviorist. 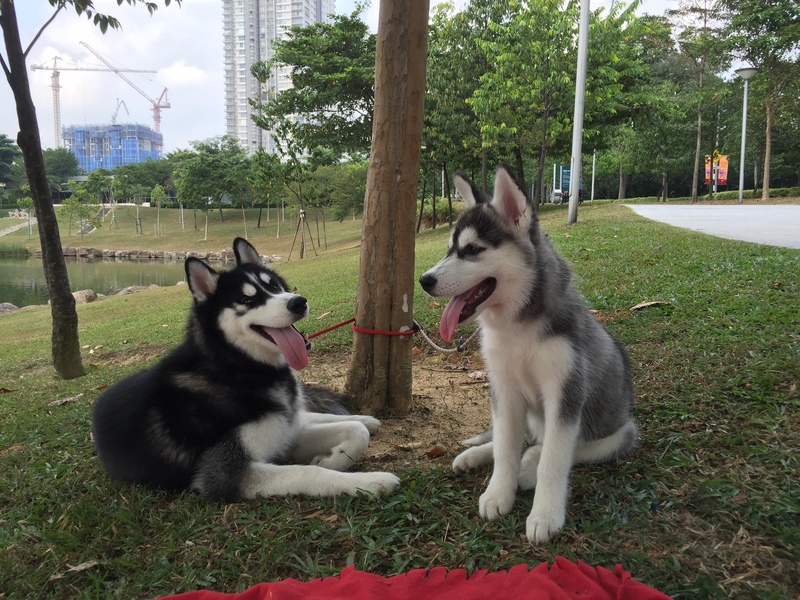 I am just writing to share my experiences with my two babies Siberian Huskies and what we have learnt from them. I just wanted to write a few points of what I discovered and hopefully this would serve as an helpful read for anyone who is / going to get one for yourself. I have been asked very often lately from my friends expressing their interest in getting a husky mainly for reasons I am not so sure of.. So I hope this would help them in their decision making. Cloudy and Terra is not my first dog, but it was my first big active dog. It was Nicky’s first puppy though. But let me tell you this, whether or not it is your first dog, a husky puppy is no other puppy you’ve seen. They are definitely harder to care because they seem to constantly get sick a lot as a puppy (maybe is just my puppies) and any home remedy you know from your past dog experience doesn’t work on them. They are extremely adorable yet extremely cunning and active as a puppy especially when they reached their peak of 3 – 4 months old. 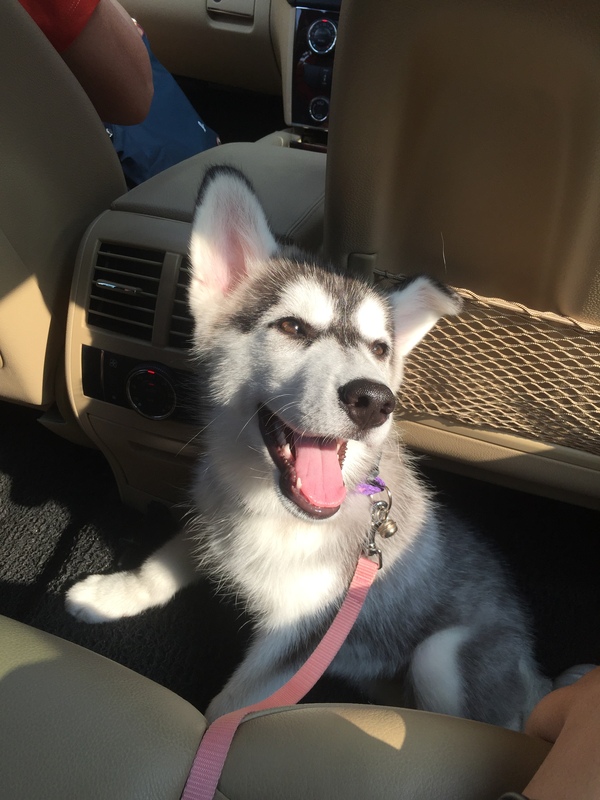 (We are dealing with our Terra who just turned 4 months old and it’s still a challenging task to us even if we have some bit of experience with our older husky Cloudy) One of Cesar Millan video did mentioned that Husky is not an ideal first dog. We hope we’d seen that before we get Cloudy, but since the damage is done, we’ll just go through it one step at a time. 2. I’ll take exceptionally good care of them and I’ll make time for it. It’s gonna be my baby! That was exactly my thoughts too when we get both our puppies. We have even planned on our walking schedule like once every two days to dog park visits… Now that we have them both, I can tell you that is completely WRONG concept. Firstly, is the commitment we can’t keep and secondly the nature seems to rather much have it’s own way. As much as we like to stick to our schedule, we cannot fully promised that there’s nothing came up that we have to work around it. Puppies learn from consistency and we have an unfixed schedule and expect them to adapt, your puppy training may take longer, and higher chances for them to throw you tantrums.. (i.e. destroying your lovely belongings…) We have noticed the definition of good care is very subjective.. I babied Cloudy and he became temperamental. I babied Terra, she become an overly attached puppy. I’d say to me by treating them like a human baby was the best I can give them. Nope I was completely wrong. All they need was me, leaving work slightly on time / early to get back to them and bring them out for a two hour walk. And my weekends are totally dedicated to their park going. And trust me, after that they’re the most lovable puppies I’ve ever seen. Research never really tell me this and I’d wish someone would enlighten me how much I’d have to give up weekends for them. 3. Is OK, every dog sheds. I can manage with the cleaning and the grooming. This one really tricked me! When both of us was doing a research prior in deciding on getting a husky, it says they sheds twice a year. So we thought, alright, twice a year for major hair shedding, it should be easy to manage. Nope! It didn’t mentioned that yes huskies sheds twice a year, but they technically will fall out loose hair all year round. And that amount of loose hair you’re gonna find in your house, is unbelievable a lot. I constantly make a habit to brush Cloudy as much as I can, but it seems to me no matter how many times of brushing his hair still sheds and he still have loads on them. He’s a very bushy and fluffy puppy. Terra, is currently loosing her puppy hair. But with two huskies, I can see the coat differences clearly. Cloudy is definitely thicker coating and Terra is coating is thinner and much easier to dry. But somehow, that didn’t matter because with two huskies, you’d probably learn to adapt having loose hair everywhere in the house regardless how much cleaning you do. So this is depending on how much you can tolerate. 4. 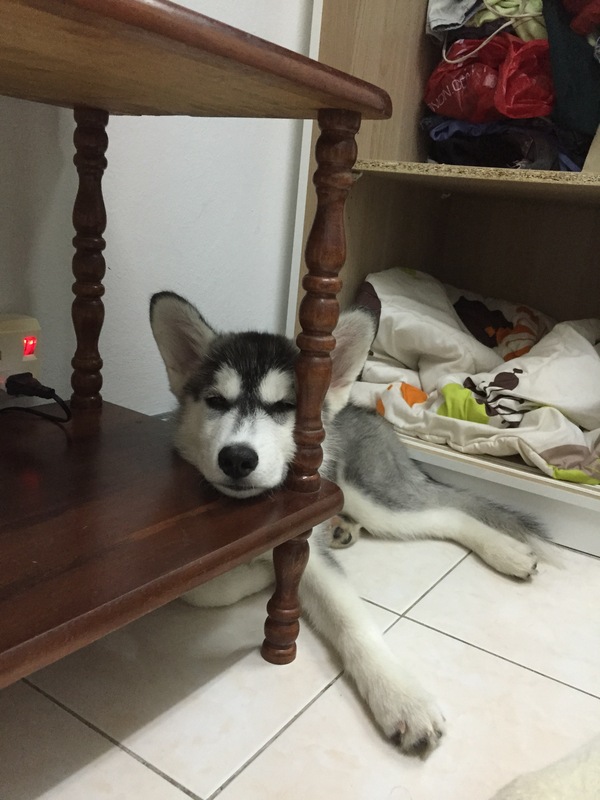 Husky are smart dog. Training would be easy and quick. And I’ll sign them up for obedience training. Yeap, they are smart. But so do every other dog! I haven’t really experience the smarter side of husky in both Cloudy and Terra. To me, their ‘smartness’ is just like any puppy eager to learn and hungry for treats. They’d do anything as long as you have food in your hands. Cloudy took about 1 month to learn potty training and the first 2 weeks was hell to us. This is because we as owners were very confused at that time and probably using all the wrong methods. Terra, took 1 week to get it 100% right. Despite already knowing how to potty train, they’d still need constant reminder on it. Every morning I still do the routine and requesting them go toilet with a command. So I can’t really judge how is husky a smarter dog than any others. Sit, hand and stay… they just seem to come along every time the treat is on my hand. Obedience training is a good way to stimulate their brain! We have signed up Cloudy for obedience training and we go for 3 classes and given up. Why? Well because that training wasn’t what we are looking for in our pups. We read and experience that the ultimate goal was we just wanted a calmer puppy and an easy to walk dog. And we find that obedience class didn’t do Cloudy any improvements. He was good in the class, but not when we get home. At that time, we took granted that the obedience class would naturally give me a good dog by just committing to the class every week, but we didn’t learn that it was a commitment more than every Sundays. I would honestly admit we gave up too easily. Thankfully now that we have a mentor which we’re really lucky to have met and appreciate it very much, our dog walking is getting better and we’re happy with our ‘home-dog’ which probably doesn’t do more than sit, stay, come… but we’re OK with that as long as they are chill and calm outside and at home 🙂 For tricks I’ll teach them whenever they want treats and they’ll usually just do it for the treats. LOL. We never do kennel train with both of them. Simply because we find that keeping them inside kennel for more than 8 hours (my working schedule) feels bad for myself. I mean who would want to be cope up and be confined in such small area for 8 hours? That’s my human psychology. I wouldn’t know what Cloudy and Terra would think of that. Anyhow, because of that, they never like to be confined, even if it’s a room. But we’d like to introduce it to them when we get our new place settled in and it’ll probably do everyone good. Since I don’t have a huge backyard for them to go in and out, and my apartment is rather small for two huskies, they basically get to roam around the house with not much trouble in potty… (just occasionally some belonging of yours being destroyed). I have heard some husky destroyed sofa, cushion or furniture… Thankfully Cloudy and Terra didn’t do any major damage to my house. But I’m totally not very sure about other husky puppy. That is what I’m doing. Giving them exposure to the outside world. Cloudy traveled with me since 4 months old to pet friendly cafes and places which they are OK with him. Terra started since the 1st day we brought her home. When they were puppies it was definitely much easier to transport them. But as they get older, they’re bigger and definitely can’t be carried. Also, we’d to see if places are OK with Siberian Huskies. Some places are pet friendly for small tiny dogs but not when they see bigger dogs. Fortunately there are still places that are trilled to see huskies, but we can’t take granted for this. 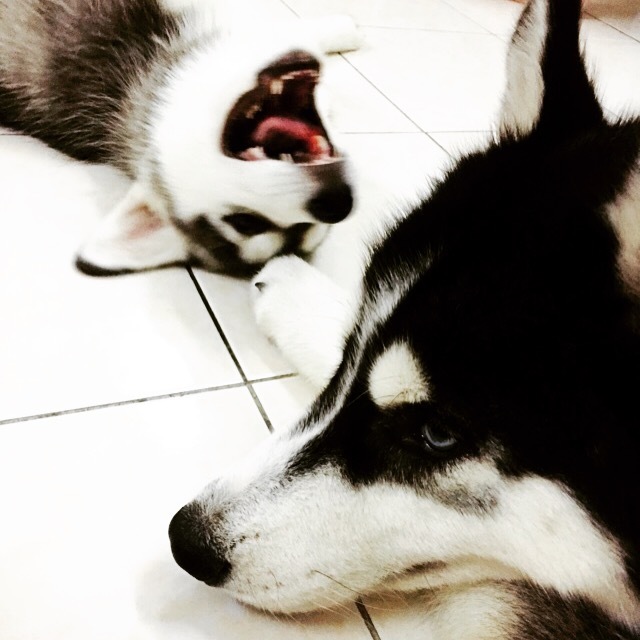 And an important thing, provided your husky is not overly active and start destroying the peace in that place. I’m always up to bring them along as much as I can and training them to be calm outside at public areas is our ultimate goal. That is a paradise we hope one day we can achieve. Unfortunately our bank account cannot permit us to get a nice landed property in a decent area. (getting one is still part of our plan). 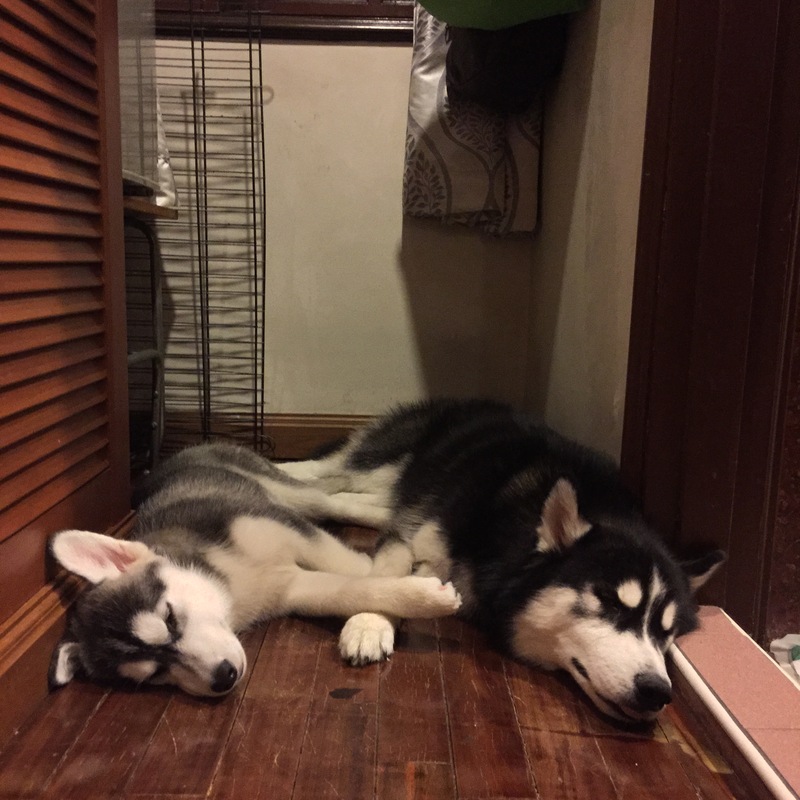 For now we can only afford apartments and I admit is very unfair for my huskies because all we wanted at that time was a companion and we stubbornly got ourselves two because we think that staying in an apartment cannot stop us from getting what we want. Many people see us a little bit overwhelming cramping ourselves in a small 800 sq ft place. But I can tell you this, as much as my tiny place has seriously not much furniture which gave them plenty of space to move around indoor, they’d still like to stick to us in our small little cramped room. Cloudy and Terra do play outside the living hall with their toys, but 80% of the time, they’d sleep in the house. Maybe this is because they basically have nothing to do at home. We have tried letting them experience backyard fun but they only stay outside for like 30 minutes and they ran back indoor back to our cramped rooms. So from our dogs, I can say, it doesn’t matter how big or small your place is (though of course bigger is better) , it’s the time they want to spend with you counts and they always look forward to going out for walks…and long walks. Yes, and I guess many dogs with strong character are stubborn. My Maltese never give me any problems before but my brother’s poodle is a stubborn one and I also see my aunt’s poodle a stubborn dog too. 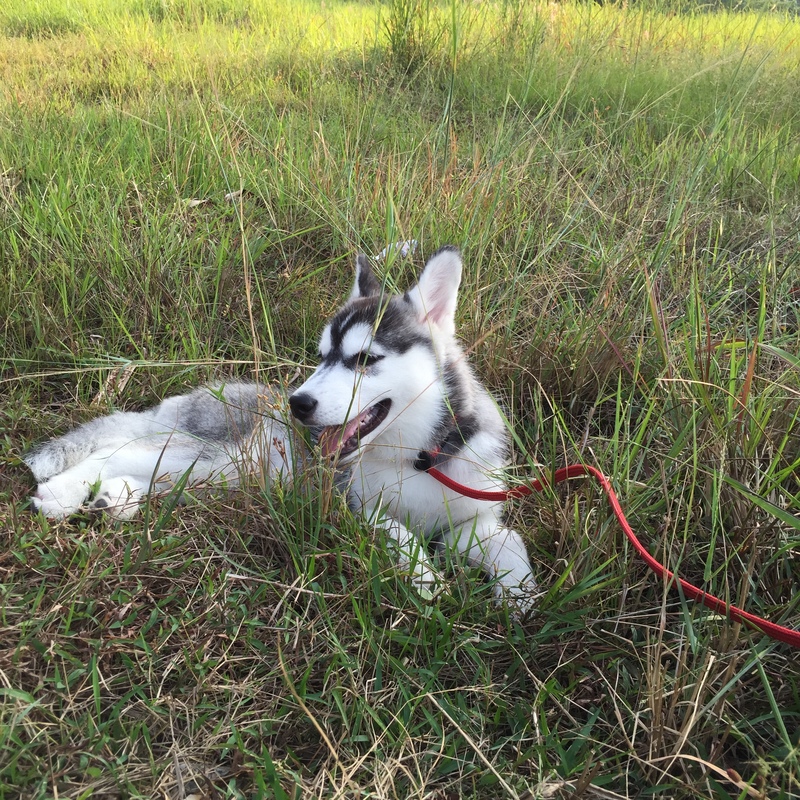 I’m not really sure how husky stubbornness is compared to the others but yes, Cloudy is one stubborn puppy. But later on we learn that it wasn’t him that was stubborn, it was ourselves that were confused and he wants a clear direction and strong command and consistency. That is if you know how to select the right puppy. I never know about puppy personality you can see when you select them until I was this episode from Cesar Millan. I always thought getting a active puppy is a healthy and loving puppy. After watching that episode, I am thankful we got Cloudy but not Cloudy’s sister which was a lot more jumpy and whiny at that time when were were presented the options. Cloudy was a focused puppy because he did not react impulsively to our distractions but that doesn’t mean he was a good puppy. We do have our times with him. But then one thing for sure, he was always an easy going pup. Terra was a little bit more active but she was calm at our side. Like now we are still working with her, she is calm but she can have her moments too. Still up to this day, I couldn’t really say how you should select a puppy. But I’d keep in mind that the next time I select a puppy I won’t just go for the cuteness and the looks. Juggling work life balance is still my aim to achieve. I work in an advertising industry (a fast pace high turnover job). As much as I am passionate about my creative work and my fast pace life, I am experiencing a little of mis-management at home. I wanted more time for the dogs and I also wanted more time to strive for my career. So I can’t have both at the equal amount, either one would deserve more than the other. Thankfully I have my other half to deal with our huskies when there are times I have to stay at work late. I cannot neglect my career and I also cannot neglect my family and my dogs. To be honest, this is still a constant debate in our daily life. This is subjective. Every human deal with issues differently. We have had a few arguments when we brought Cloudy home and during the housebreaking times. One of us was really depressed and thankfully we both try to support each other and we put each other (the humans) first in our priority then our dogs. Then we got Terra, I was so annoyed I wanted to give her up. Sometimes we tell ourselves that when we don’t have dogs, we get to go late night movies, date nights, fine dines and travels together. To be fair with everyone, we hardly have that moments anymore. Sometimes, we teach other what we did wrong. We discussed this often and ask ourselves how are we doing now and whether we enjoyed it. We are committed 15 years of dedication to our dogs, and we constantly keep each other strong and remind ourselves why we gotten a puppy. But then again, I am not sure about other couples. Some decided to part ways and their dogs looses someone close to them. Some left the dogs to their parents-care after parting and some due to dog issues they cannot deal, they decided to either give up the dog or give up the relationship. 14. Why did I get a puppy but not an adult husky up for adoption? Well firstly, prior to getting Cloudy, we did look into adult husky up for adoption. 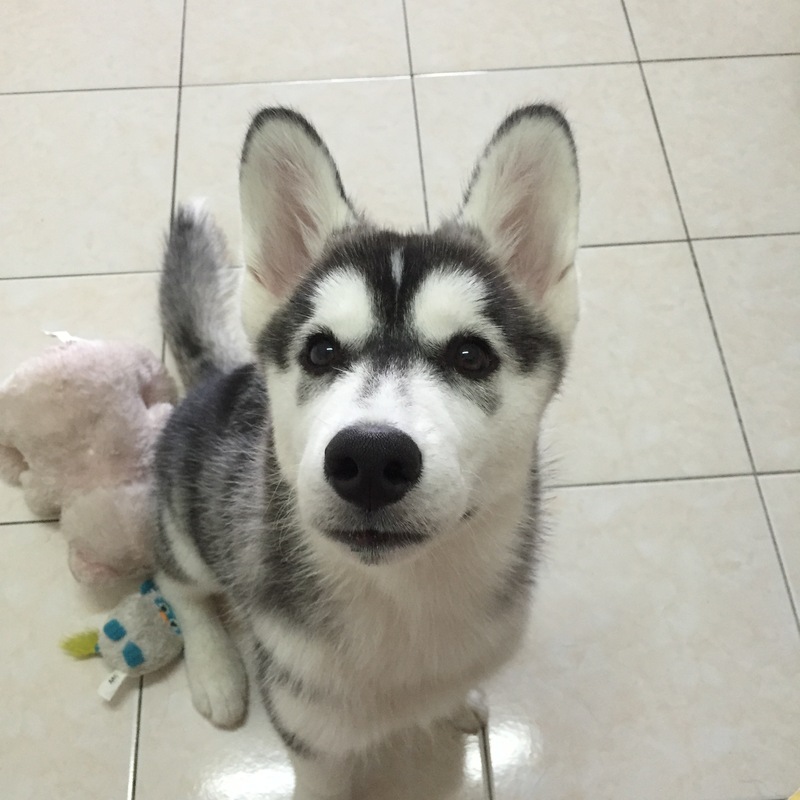 At that time, we didn’t join My Pet Husky Club so we didn’t encounter much of husky up for adoption. But we did look into that, but never got the decision to adopt one. We saw two beautiful 1 year old husky with bi-eyed and I was really interested but didn’t pursue. At that point of time, I thought that getting a puppy would create a stronger bond for Nicky who has not gone through any puppy moments before and well puppy to me was much cuter. And the reason why for Terra I didn’t adopt but get ourselves a puppy again, well that was because I was worried if I adopted an adult dog that couldn’t get along with Cloudy I would need to deal with more other problems or if the adopted dog I cannot bond with. Both is equally unfair to the adopted dog. For me to get an adopted dog means that I would be completely 110% responsible and the day we promise to bring them home, no matter what character or issues, good and bad we have to accept it. I admit, I wasn’t ready to deal with adopted dog issues or ready to handle one. But we promised ourselves the next time when chances or time permits, we’d go for adoption. 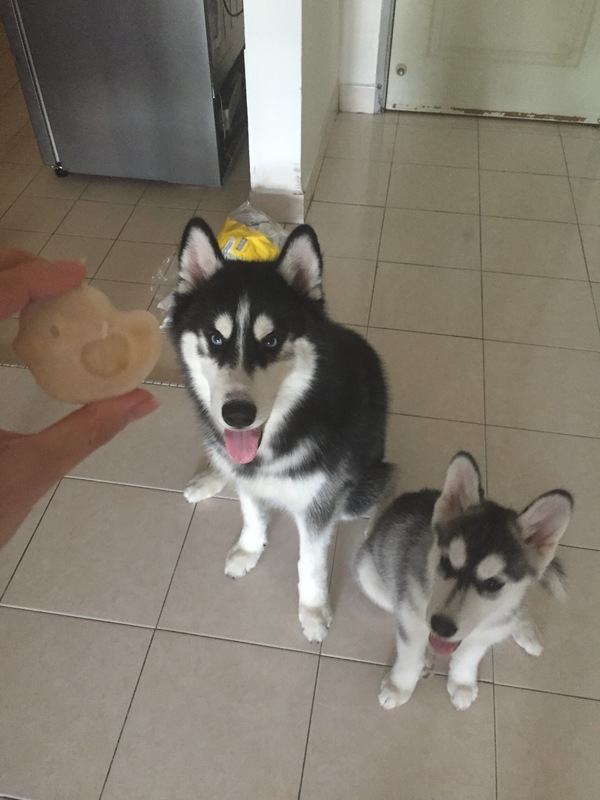 We always remind ourselves now that we have our husky everyday in our life, but our husky only have us for their everything. Urmh, for the one time, we really missed out and under estimate the spending. Cloudy was a sick puppy and for the 2 weeks of constant vet visit, it took us few hundred bucks gone just for the medication. That is not inclusive the food intake. He was one hungry puppy. We decided on Blackwood kibbles which is on the more affordable range. And chicken meat from the market. Cloudy gets diarrhea a lot and as a worried fur-parent I panicked so there got our vet visit and money from our pocket. Then we have planned for his neutering fees end of this month which is half of our ang pow money gone for him. And we have our 2nd dog which well lesser vet visit, but still undergone some for his kennel cough. Due to Cloudy’s picky eating, I have given in his tantrum by feeding him Cesar wet food (cost RM3.80) and 1 can only last for 2 meals. Now you do the math, and I would estimate RM300 from our pocket every month for just their food and care. 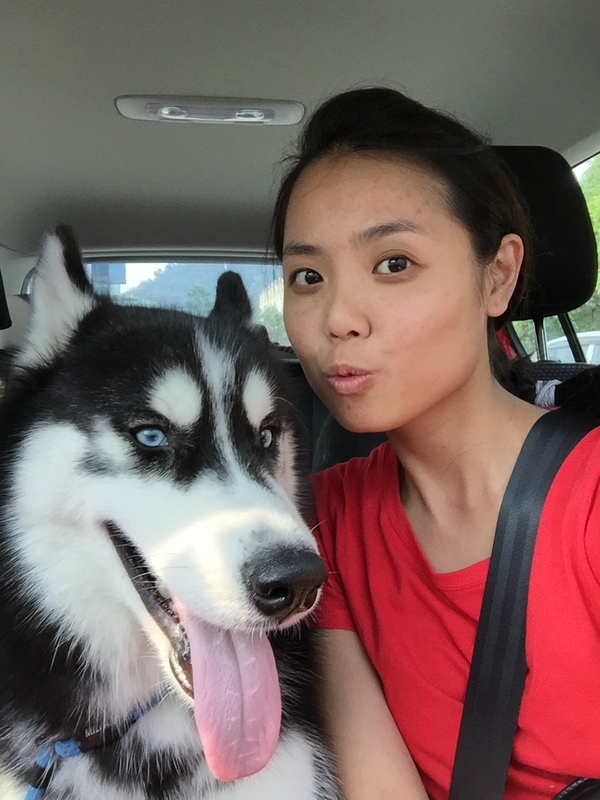 Not inclusive for the unpredictable vet visits, longer air-cond hours, park hour parking, petrol and grooming fees once every 2 weeks and other necessities like wee wee pads, treats, groom brush, frontline, thick spray, heartgard… etc. When you are ready to battle through and enjoy every moment of it, these are the small rewards … They lovely happy faces. Again I would say, without them around, I could probably be travelling to australia, singapore, korea, or anywhere else I feel like too. But then again, this is what we have decided and we have made them part of our life. Disclaimer: This is not a sponsored post. 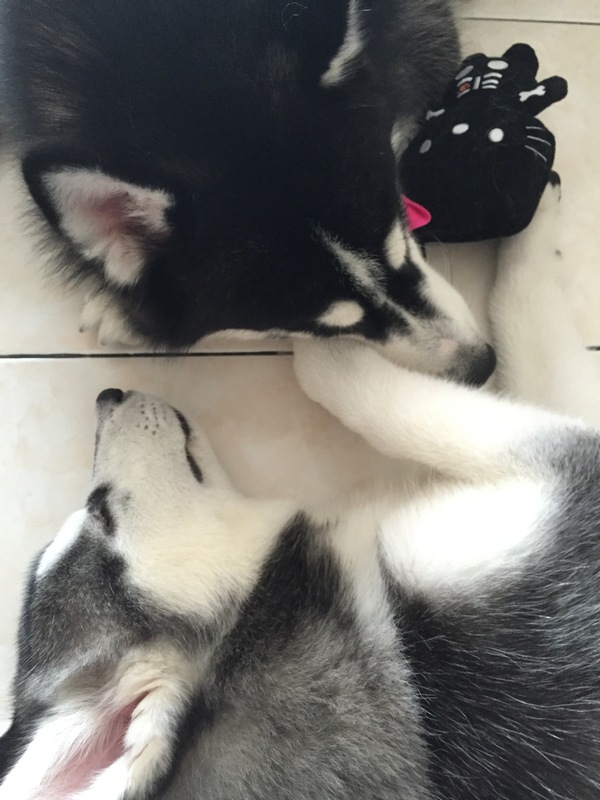 All opinions are my own and is based on the knowledge and my experiences with my two husky puppy. Previous All set for 2015! Next My sibe boy , Cloudy.. When City Slickers (DOGS) Met Nature! How did we potty train Faye? What shampoo we use on our dogs? What should I feed my dog? Dry Kibbles, Home-Cooked, or BARF?